A Sub Zero refrigerator sure looks nice, but is the extra expense worth it? Most people who visit our showroom ask us this question. If you are a fan of organic food complete with plenty of fruits and vegetables you will appreciate having a refrigerator that keeps that produce fresh longer. Design is also a huge plus with Sub-Zero refrigerators, since they are available in a wider variety of sizes than their standard counterparts. These refrigerators are able fit seamlessly into the cabinetry of high-end kitchens and almost “disappear”. All in all there are several reasons we tend to believe these units are our worth the price, and here are some of the main reasons. Food Freshness On average we waste a chunk of money on food we throw away. Your food will live longer in a Sub Zero fridge. Quality/Longevity Designed for over 20 years of use with an industry leading warranty. Best service and support sets it apart from distant competitors. Design Flexibility Full size built-in refrigratos, fully flush integrated models, infinite paneling options, vast undercounter selection. Even pro look for the home. Home Resale Value Stellar brand recognition. Always mentioned in real estate listings as a differentiator. Sub-Zero prides itself on its ability to preserve food far longer than others. According to the company research, on average, a family throws away in one year more than $1,500 worth of food. While most refrigerators do a good job in keeping your food cold, it is the ability to control temperature fluctuations and humidity that allows you to get the longest possible shelf life. Besides, Sub Zero has computer driven air purification system that works 7x24 to ensure freshness in your fridge. We will dive a bit deeper into several of the key features that help to set Sub-Zero apart from the rest. Two separate sealed systems are used to control the refrigerator and freezer. This allows the separate compartments to stay at optimal humidity levels and also prevent flavor transfer. This allows the units to hold a temperature that is far more consistent than most. In fact Sub-Zero maintains a temperature within one degree of the set temperature at all times during normal use. This is very impressive when you consider that other refrigerators see temperature swings of up to 14 degrees. Simply put, consistent temperature will allow food to stay fresh far longer. Sub-Zero has a patented vacuum door seal system. This means that all four sides on the unit vacuum seal when you close the door in order to maintain optimal temperature. These units contain an antimicrobial air purification system that automatically scrubs the air every 20 minutes. Many fresh foods emit ethylene gas which causes other foods to spoil much faster. By filtering out these gases, along with bacteria and mold spores that are found on many fresh produce, your food will last far longer. The quality standards this company holds are second to none. The raw materials used are the best. They simply do not compromise when releasing new units and the products are designed and tested to last 20 years. They also test every single unit in the factory before it is put in its box. There is no question that this company has arguably one of the highest levels of service and customer support in the industry. Besides delivering a world class product, if something should go wrong you can rest assured that it will be taken care of quickly and efficiently. They also have one of the best factory warranties. ou receive a full two-year warranty which is all inclusive. You then carry a full five years on the sealed system, which is essentially the heart of the unit, including compressors, condensers, evaporators, driers and even tubing. You then continue to be covered on the sealed system with a limited 12-year warranty. No other brand of refrigerator offers as many models and configurations as Sub-Zero. If design and layout are important to you, this needs to be considered. Sub-Zero has more brand recognition than any other appliance in the industry. If a kitchen has a Sub-Zero it will almost always be mentioned in real-estate listings because that can become a deciding factor on the purchase. People know that a kitchen can be one of the most expensive renovations of any home so as soon as they see the name Sub-Zero, they automatically assume quality across the board. There are three types of Sub-Zero refrigerators on the market, each with its own unique benefits. Considered the classic look for Sub-Zero refrigerators, BI units were the original concept for this type of refrigerator. The doors on BI Sub-Zero refrigerators protrude slightly from the cabinet surface, but they can be made flush with an inset installation. However, in doing so, it’s important to make sure you leave enough room for the doors to open. BI units come in four configurations: column, French door, over-and-under, and side-by-side. You will find differences between the Sub Zero built-in vs. integrated refrigerators in our in-depth review. More than 30 different configuration options make this popular with homeowners who want control over their kitchen design. Since there are no exposed hinges or grills, you can seamlessly flush mount this unit without leaving space around the perimeter of the appliance. This allows you to make an Integrated Sub-Zero disappear into your cabinetry. There are two types of integrated models: column and over-and-under. In a league of its own, Pro 48 is the top-of-the-line model for Sub-Zero refrigerators. The company often refers to this line as an 800-pound monument to food preservation. The look of the Pro 48 is reminiscent of what you’d see in a restaurant kitchen, but its beautiful design makes it the perfect fit for your home. In addition to its attractive design, the Pro 48 has triple evaporators, with each serving as a separate control for the freezer, refrigerator, and refrigerator drawers. Is a Sub-Zero refrigerator worth the price? At Designer Appliances we believe that if fresh food and flexibility in design is important to you the answer is yes. You are also buying a unit that should last you 20 years so that it also an enormous benefit (imagine spending $2,500 to $3,500 on a popular Korean brand for an appliance that might last 7-8 years for quick math). 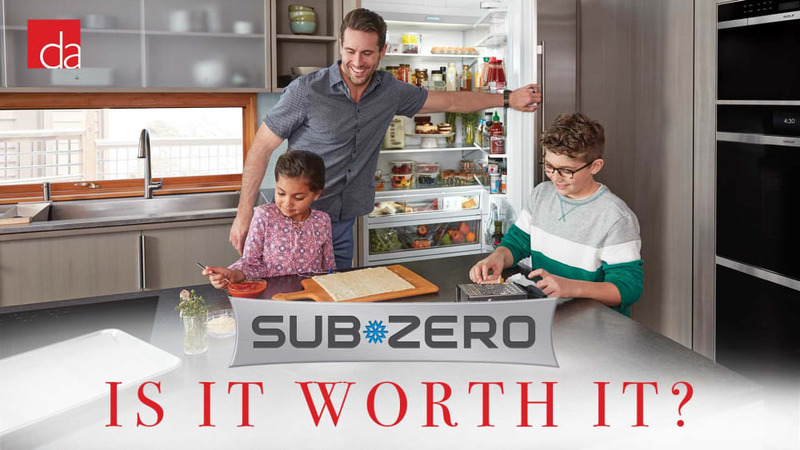 When you purchase a Sub-Zero you are not just buying a refrigerator, you are investing in the heart of your home and overall lifestyle. Yes. Sub Zero acquired Wolf Ranges back in 2000. The comapny now makes not only ranges but a entire category of Wolf cooking appliances and ventilation. We cover Wof ranges in detail in our blog articles and videos. Does Sub Zero make dishwashers? Yes. Sub Zero started making premium quality dishwashers under the brand name Cove. Leading consumer reporting company review talks about louder noise levels on Sub Zero, is this a concern? The publication we saw was from 2012 and not up-to-date. As a user of an earlier generation Sub Zero in an open-plan kitchen, I did experience the compressor noise when it was active (mind you all fridges were noisy 10 years ago). However, the new generation models, especially built-in series with top compressors are now substantially more silent. Sub Zero's integrated models have the compressor on the bottom and are inherently silent. I have an old Sub Zero refrigerator can I replace it with a new one? Will it fit? Yes. you will be able to replace your old fridge with a new one. Also, please contact our sales staff for promotions and incentives that Sub Zero offers for loyal customers. We covered transition from an older version Sub Zero refrigerator to the contemporary models in our in-depth article.